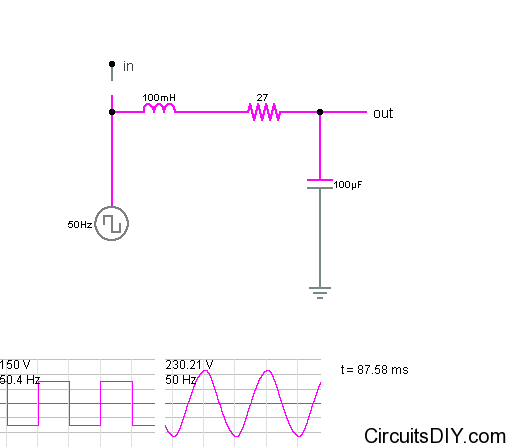 There’s pretty easy to make square wave inverter circuit in the internet. But to run most load like fan, TV, etc you need to have a sine wave inverter. Making sinewave or near-sinewave inverter is more complex and costly. But we can also convert square wave inverters to sinewave inverters. A LRC resonant circuit is needed for this. The values determine the output frequency and waveform. For a 50Hz 150V square wave output to become 230V 50Hz sine-wave, you need the above circuit connected to the output of the inverter. 100mH (0.1H) inductor, make sure you get high amperes rating ones. 27Ohm resistor, get atleast 50Watts resistor for a 250Watts inverter. 100uF nopolar capacitor. Get 450V ones. Assemble the whole kit like the diagram above and connect the output of the inverter to the input of this circuit. 1) i got 230v 3000WATT/square o/p what changes i have to do? 2) 50Watts resistor for a 250Watts inverter,SO what should be the value for 3000watt inverter. This is a fix for small projects. For 3000Watt, you better modify the driver to sinewave. Brother Arup, upto which rating it can be used. How can you modify the 1500w square wave inverter to a sine wave? hi sir, i have a 60 watt sqere wave inverter this circuit is comfortable my inverter and how can i made 100 mh inductor,plese help me…..
You can make the inductor using enameled copper wires and making a solenoid. Just Google for the process and calculations. Thanks. Enter your email in the subscription box in top-right of the page and subscribe. sir i have 240vac square inverter running on 60hz sir, how can i convert it sinewave? With hight pass fiter. thanks. On powerful inverters, this cant be done efficiently as there will be much more loss. Yo9u need to change the driver of the inverter. I am from Bangalore have a 15 yrs old 500 VA trimmed square wave inverter in still working condition. But I can’t use it now as it can damage new generation appliances may be due to the frequency problem that doesn’t match. How can I convert into sine wave and make use of it. I asked many but didn’t get result. Could you help me? I suggest you buying a new inverter. I’m designing a frequency doubler using PLL LM565. The output of the PLL is a square wave ranging at high frequency (MHz). How can I convert this square wave into sine wave? With this cct you have, it doesn’t seem to work well in high frequency. For this circuit to work in high frequencies, you need to have specific valued LRC circuit. based on your circuit, how come the voltage after the low pass filter was step up from 150 v to 230.21V? No energy is lost (ideally) in this circuit. The energy in 230V sine is the same(a bit less) as in 150V squarewvae. Just do a simple integration to prove it. This is a super idea. I built an inverter with CD4047 and IRF540. Is it possible to make that inverter into a sine wave inverter ?. No, that inverter can’t be converted to sine-wave inverter without external circuits. There is no efficient way to get pure sinewave directly from a MOSFET (IRF540 in your case)… The only way is to emulate a sinewave through PWM. I am looking for a simple circuit as you have as it has to be passive. I want to take a 200Mhz square wave ~5V and convert so sine wave. Can you provide suggested values with equations for circuit? I’m so interested about your wave conversor project. I have one 1000w 12vcc to 220vac inverter, and i need to convert the square wave to sine wave. What changes i need to do in your scheme? Hi Arup, I have a 350w (500w peak) 230v Inverter. Would this mod work for my unit?To do the modifications should I just double the current rating for all the components?